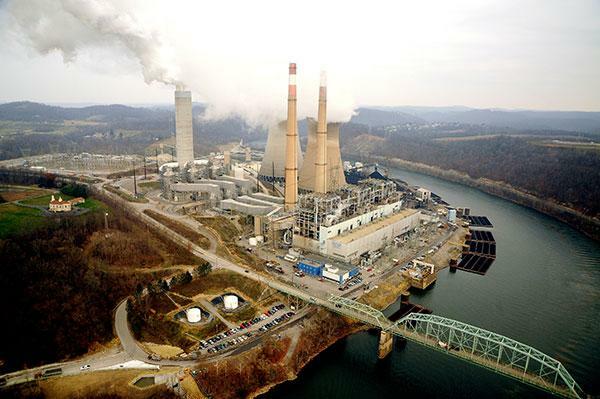 July 9, 2013 by Ken Ward Jr.
FirstEnergy Corp. (NYSE: FE) announced today that it expects to deactivate two coal-fired power plants located in Pennsylvania by October 9, 2013. The decision is based on the cost of compliance with current and future environmental regulations in conjunction with the continued low market price for electricity. The plants scheduled to be deactivated are Hatfield’s Ferry Power Station in Masontown, Pa., and Mitchell Power Station in Courtney, Pa. The total capacity of these plants is 2,080 megawatts, representing approximately 10 percent of the company’s total generating capacity, but about 30 percent of the estimated $925 million cost to comply with the Environmental Protection Agency’s Mercury and Air Toxics Standards (MATS). It’s worth noting that Hatfield’s Ferry had not so long ago been retrofitted with sulfur dioxide “scrubbers”, and had more recently been under consideration for a fuel switch to natural gas. FirstEnergy had previously announced closures of six plants in Ohio, Pennsylvania and Maryland, and three plants in West Virginia. And while Hatfield’s Ferry had new scrubbers, the toxic stuff generated by burning coal has to go somewhere, and environmental groups were concerned about the water pollution from the scrubber waste at the facility. I live a bit north of this plant. My air will now be a bit cleaner. Hopefully, the huge Bruce Mansfield plant to my west, then Homer City to my east will be next. All my electricity comes from wind energy certificate-based supplier, at a price comparable to, or just a bit higher than First Energy’s residential rates. Wind, solar, new-generation nuclear, and the infrastructure to support them could provide as many good (union) jobs as those lost phasing out steam-coal power. Why are Americans so afraid of the future, and want to cling to the ways of the past? Coal-fired power plants are closing primarily because their technologies are no longer competitive and because demand for electricity will essentially be flat for the foreseeable future. New health regulations have some bearing on which coal fired plants power companies decide to close, but that is not driving the overall pressure on the industry. Here in WV, regulators and politicians have their heads in the sand. They would prefer to see coal-fired plants close one by one, without replacing those jobs with new jobs in new efficiency and generation technologies. In New England last winter, The chief executive of New England’s power grid said last winter that they were paying as much as eight times what other regions were paying for natural gas, even though temperatures weren’t especially low and power demand wasn’t high. The reason was because of bottlenecks and poor infrastructure. In other words, can’t get enough gas when they need it. It takes so much more natural gas to equate to coal’s output BTU’s at any power plant. Compare FirstEnergy’s gas plants with the output of their coal fired plants. Demand for electricity will be flat by necessity more than anything else. To be clear, the “first paragraph” that is the source of Steve’s quote is the first paragraph of FirstEnergy’s press release. Of course FirstEnergy wants to put the blame on new health regulations, instead of their own failure to innovate and create new jobs. I just returned today from a trip to Reynolds, Indiana. I saw literally miles of wind turbines. About half of the wind turbines’ weren’t rotating. Seems someone turned the wind off. I believe diverse sourcing and distribution of energy is a good thing for our country, but we need to be realistic. Shutting down coal fired power plants at this point is unrealistic. I don’t know of many power utility companies as innovative and diverse as FirstEnergy. If natural gas would be a more lucrative fuel for them then coal, why then blame regulations? The fact remains that natural gas will not keep up with demand and with demand coal will still be used. At some point in the near future the public will wake up and see they have been somewhat duped. If you believe that market prices reflect the real value of various kinds of generation in the market place, then you should listen to what the markets are telling us. These plants are closing because the electricity they produce is too expensive to be dispatched by PJM on a regular basis. The Kanawha Power Station, before it closed, was only running about 10% of the time, because its electricity was so expensive that PJM would only dispatch it at high priced peak periods. Capacity factors of gas-fired power plants used to run around 25% to 30% when they were used as peakers. Now they are producing more and more base load and swing load, and the average capacity factor for a gas-fired power plant in PJM is around 63%. At the same time, capacity factors for even the most efficient coal fired plants have been falling from around 90% a few years ago, to the 60s and 70s, approaching the capacity factors for gas fired plants. So nobody is duping anyone. Power companies and RTOs are doing what the market is telling them to do. Two key points about the first site posted. 1.Its coal fleet has not only been transformed through environmental improvements, but has continued to improve its ability to operate when called upon. Translated: Coal must be used during peak periods. 2. Demand response programs reward customers who agree to reduce their energy consumption during periods of peak load through such actions as cycling air conditioners on and off, reducing lighting, and shifting industrial schedules. Translated: Power rationing. Just how long will industry and the public put up with this? We can all save if we shut off the power. This conversation ignores the health effects of the emissions from these two power plants. I live right between these two plants, and the new standards will reduce incidence of bronchitis, heart attacks, and asthma attacks in my area. I have asthma and have to use my advair inhaler every day to keep it under control. Even so, about three months ago, I had to go to the emergency room in the middle of the night because I was having trouble breathing. The new standards will also reduce our mercury exposure, which is linked to neurological problems and poor cognitive development in children. These standards were originally passed in 1990. Power companies have known for decades that eventually Congress would require them to meet the standards, and they repeatedly chose this year’s profits over the health of the people. I wish our society was better at planning transitions so that the 380 workers at these two plants weren’t suddenly told that in three months they won’t have a job. But it’s the kind of foot dragging and stubbornness that we see in the company’s behavior and in this discussion that prevents that kind of planning. Perhaps now Steve can share with us some of the industry-funded anti-science studies. A 2009 article estimated the twenty year cost of bringing the natural gas pipe line infrastructure up to par for the US and Canada would cost 130 to 210 Billion dollars, with much of the lines going toward electrical generation. As a matter of fact about three-fourths of the market growth occurs in the power sector, according to this report. Now we know that we are already almost four years in, and who do you think will boot the cost? This article also says that the U.S. and Canada will need 28,900 to 61,600 miles of additional natural gas pipelines through 2030. This study doesn’t count the replacement of old and warn lines. The over zealous premature shutting down of coal fired power generation (in my opinion) will hurt us all, but especially those on fixed incomes and the poor.